As Noel Tock explained at WordCamp Europe 2018, we’ve potentially hit “peak WordPress”. With that in mind, some are now looking forward to the next evolution of the platform. While no one can say for sure what the future holds, a ‘Digital Experience Platform’ (DXP) looks to be the latest method of reaching fresh customers. This is a strategic way of taking preexisting techniques and finding a modern, cohesive framework for them to coexist in. Throughout this post, we’ll discuss WordPress’ evolution, and the roadblocks the platform faces. We’ll also talk about how DXPs and personalization are the future of WordPress. Let’s jump right in! Before we talk about WordPress’ current state, we should take some time to discuss how it fits in to the broader ‘web publishing’ field. As you may already be aware, WordPress currently dominates this niche, as the platform of choice for over 32% of existing websites. In fact, of all websites using a Content Management System (CMS), WordPress has nearly a 60% market share. However, over the past few years, there have been more solutions cropping up to try and make their own mark. For example, Joomla! is a younger CMS that has now risen to be the primary alternative to WordPress. What’s more, website builders like Wix and Squarespace have become prominent solutions. Their large advertising budgets make it possible to position themselves as viable options, sometimes at the expense of WordPress (and WordPress.com to a lesser extent). Medium has also developed into a credible contender, as a blogging platform with clean visuals and a user-friendly back end. This wealth of content-creation solutions – many of which offer drag-and-drop builder tools – has caused the WordPress community to consider how the platform can recapture some of the market share it has lost. It’s fair to say that the core functionality of WordPress hasn’t changed much over the past 15 years. That may be a surprise, but the back end, editor, and template structure are all pretty similar to the platform’s past iterations. This isn’t necessarily a bad thing, as it means the workflow has been refined to near-perfection. However, given the wide variety of WordPress’ applications, coupled with the rise of platforms like the ones we mentioned earlier, there’s a definite need to consider whether we can create content in a better way using this CMS. So far, there are two main developments over the past three years that have contributed heavily to WordPress’ evolution. First, the REST API took WordPress from a ‘closed shop’ with regard to how it integrates with other programming languages and APIs, and essentially opened the door. 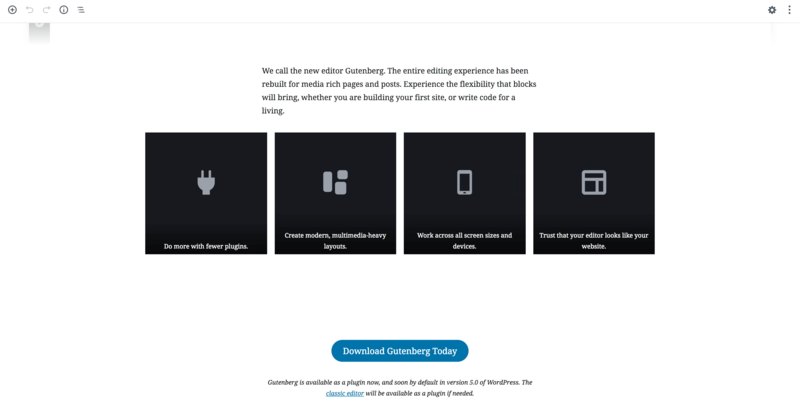 At this point, you’re probably aware of how Gutenberg works and its potential impact. For our purposes here, what matters is that it’s a clear representation of what’s important to WordPress’ developers right now – beating the opposition. It’s no exaggeration to say that the introduction of Gutenberg has split opinion (at the least). However, some are having a broader discussion about how to best position WordPress as the future of publishing on the web. In case you’re not familiar with Noel Tock, he’s a web designer who specializes in project management and WordPress. More importantly, he’s a partner at Human Made – arguably the top enterprise-level WordPress development agency. Plugins are losing value, based on the increasing complexity of themes. Interest in alternative platforms is on the rise, potentially meaning less of a market share for WordPress. Client requirements are becoming more complex, given the need to reach multiple channels. That last point is what we’ll talk more about next, as it’s a subject that’s not really been covered in-depth. Then, we’ll wrap up by discussing a potential solution to these issues. If we want to discuss where marketing and business branding are headed, it’s important to see where they currently stand. In the past, businesses have traditionally focused on a ‘one-shot’ sales approach. In other words, consumers spend money once on a product, at which point the transaction is over until a new product is released. As you can imagine, the primary focus of marketing in that system was to convert prospects into paying customers. This process was the very definition of ‘churn’, as marketing would need to target huge swathes of potential consumers in order to turn a profit. However, this approach can only take you so far. Eventually, conversion rates will slide and profits will start to drop. For this reason, many within the WordPress space (and elsewhere on the web) have turned to a subscription or Software as a Service (SaaS) model. This has meant a shift in the way businesses make money. Put simply, the primary focus is no longer on attracting new customers so much as keeping hold of existing ones. The numbers don’t lie – this is a profitable tactic, and it also alleviates the pressure on your sales funnel to win new business. As such, marketing and branding have evolved, most notably by becoming essentially extensions of customer service. Social media has become a key tool, and many businesses are using their various online channels as first-line resolution solutions. However, the current marketing and branding models are still built on decidedly ‘old tech’, in that there’s only a semblance of connectivity between the various platforms being used. WordPress has made inroads on this via the REST API, as we mentioned earlier, but there’s much more that can be done to bring the platform into modern web browsing as intended. Without wanting to break the fourth wall too much, this is usually the point where we begin to discuss how you can leverage the concepts we’ve introduced throughout the previous sections. However, when it comes to Digital Experience Platforms (DXPs), this is tough. That’s mainly because we’ve not yet figured out exactly what they consist of. Ultimately, businesses and developers have been searching for a way to provide an integrated experience to users and customers, across whatever channels they use. If this can be achieved, it should pay off in brand loyalty and repeat business – i.e. the goals of a modern business. DXP is the name given to this new type of platform. However, there’s no concrete definition for the term as of yet, meaning that we can only discuss what’s promising about DXPs. In a nutshell, imagine a marketing program that can reach a highly-specific user on an individual and personalized basis. While most marketing campaigns are currently tailored to a specific platform, a DXP will let you carry out those campaigns regardless of device. Of course, this is only a small sliver of what can be achieved through a DXP. It’s an exciting prospect and is ultimately meant to be the answer to connecting every channel your potential customers can access – or every entry into your sales funnel if you prefer. True DXPs are currently hard to find – which is understandable given how new the concept really is. However, WP Engine is at the forefront and offers a DXP platform that can help with reaching potential customers. For example, there’s a global Content Delivery Network (CDN) included with all plans, a collection of add-ons to help you ‘geotarget’ users, and much more. WordPress is central to that DXP, and potentially many others in the future. Even if it still remains slow to evolve on its own, the platform is flexible enough to provide a firm base, upon which the peripheral aspects (such as themes, plugins, and hosting) will help to ‘future-proof’ your marketing and branding efforts. It’s human nature to think a lot about what the future holds. That remains true when it comes to WordPress, an admittedly slow-evolving platform that currently has no reason to progress too quickly. However, all of that may be changing, thanks to the rise of new competitors and website builders. In this post, we’ve looked at the impact these alternatives have had on WordPress and discussed how the CMS has developed its own REST API and built the new Gutenberg editor to combat the threats to its supremacy. According to Noel Tock’s WordCamp Europe talk, WordPress will struggle to evolve further without ‘supporting players’ such as hosting platforms getting involved. As such, DXPs seem to be the future, although the fledgling concept has yet to be fully fleshed out. Are you excited by the prospect of DXPs, and what do you think the future holds for WordPress? Share your thoughts in the comments section below! The post Welcome to the WordPress of Tomorrow! appeared first on Torque.